I recently made a batch of Candy Corn Simple Syrup over at Baking Bites. It’s a honey and vanilla flavored simple syrup that is made with – you guessed it – melted down candy corn. The syrup is a great use for leftover candy corn because it makes it a lot more versatile (and more delicious) than a pile of sugary candies. The candies also don’t have a particularly strong flavor on their own, so boosting it by adding honey into the syrup really amplifies that subtle note. The syrup is bright orange and, in spite of its unusual color, it can be used just like any other syrup to sweeten and flavor a drink. 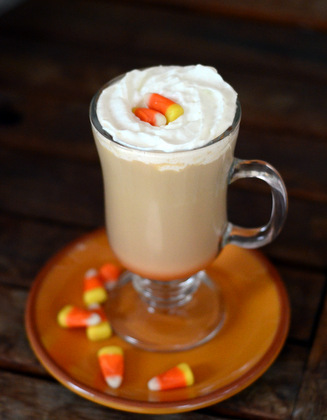 This Candy Corn Latte is made using that bright orange simple syrup and, while it doesn’t taste exactly like candy corn, it does have a hint of honey and vanilla to it that makes it a very enjoyable fall drink. I used espresso and steamed milk for this latte, though you can also use roughly equal parts of strong, brewed coffee and hot milk, as well, and poured in the candy syrup. You’ll note from the picture that I didn’t stir it in immediately so that you could see the color against the coffee at the bottom of the glass. This is a lovely way to serve it for the effect, and the syrup will dissolve almost immediately in to the drink when it is stirred in before you take your first sip. Since I was having a little fun with it, I topped mine with whipped cream and a couple of candy corn. You could also add a very small drizzle of the syrup to add yet another pop of color before serving. In a large mug, combine espresso/coffee and steamed milk. Pour in Candy Corn Simple Syrup. If using a clear glass, do not stir syrup in right away for effect. If using an opaque glass, stir in the syrup. Top with whipped cream and garnish with a few candy corns.